Those using Windows 8.1, or who wish to install the latest version of the OS, should be pleased to learn that MSDN’s latest version of that OS in ISO form has been synched up to the November update roll-up. At one time, this was to be known as “Windows 8.1 Update 3” but the version is labeled “Windows 8.1 with Update” on its MSDN download page. Nevertheless, this provides admins and enthusiasts with a good way to grab a fairly current OS snapshot for installation or repair that doesn’t require subsequent installation of beaucoups patches and fixes before the resulting image is completely up-to-date. Careful examination of downloads provided shows that only “Volume License” (VL) versions of Win8.1 Pro are available here. 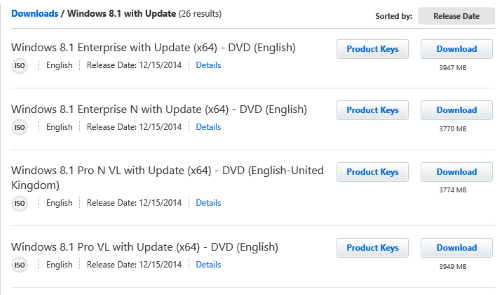 The release date on these ISOs is 12/15/2014, which means they became available about two weeks ago. But since I just learned about them today, I thought I would share this pointer with you. An MSDN subscription is required to download these ISOs, and to obtain the keys necessary to activate resulting installations. As the subscription purchase page at VisualStudio.com illustrates, such a purchase can be expensive. However, deals from third-party resellers are available (I got mine from Software Wholesale International, and bought a three-year subscription from them for about half of what MS charges; I’m on my second renewal with them, in fact).